Welcome to Watch List, where we identify five things on TV to watch while you stay at home and write your letter to the Easter Bunny and stuff your Easter stocking with treats for the youngsters. LET’S GO! CINEMA VERITE – 9:00PM Saturday (HBO) You may have thought MTV’s “The Real World” was the birth of reality TV, but you’d be WRONG! Reality television was born in 1973 with the PBS documentary series “An American Family,” in which cameras followed the Loud family around as they revealed their deepest and darkest secrets to the American public. Now, 38 years later, HBO has made a TV movie about the production of the landmark series, featuring Diane Lane and Tim Robbins as the Louds. The movie is supposed to be quite good, so keep that in mind when you watch a similar HBO film about the making of “Flavor of Love” four decades from now. ANTICIPATION: DRAMATIZATION! THE KILLING – 10:00PM Sunday (AMC) I am fully on board with “The Killing.” I’ve watched every episode and there’s no stopping me now. I WILL find out who killed Rosie Larsen, and I will find out if the shady partner guy was lying when he said he was smoking NARC reefer (it was totally real!). And yet, I have so many grievances against the show. I still think the main character of Sarah Linden is pretty boring. And her needy fiancé is, like, triple boring. Just have her stay and be done with that stupid plotline already. And I’m also not wild about the stereotypical stuff with the political maneuvering, along with completely stereotypical punk teenager characters. And yet… I’m hooked. I think it’s the lighting. Oh, and the complete devastation I feel after watching it. ANTICIPATION: HIGH! TREME – 10:00PM Sunday (HBO) David Simon’s New Orleans pastiche kicks off its second season on HBO Sunday Night. I am currently knee deep in season four of “The Wire,” which means I’ll manage to get around to this show starting in… oh… call it 2018. ANTICIPATION: GUMBO! 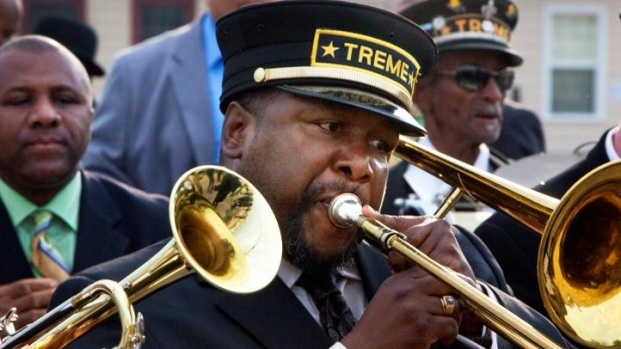 New Orleans native son Wendell Pierce talks season two of HBO's "Treme," premiering Sunday. BEYOND THE BLACKBOARD – 9:00PM Sunday (CBS) It’s an “Everwood” reunion of sorts with this TV movie that pairs Treat Williams and Emily VanCamp together once more. VanCamp plays a teacher who must win the hearts of a bunch of hardscrabble homeless students. Lessons will be learned. Bridges will be built. And there will be punch and cookies. ANTICIPATION: IF SHE’S UNION, SHE GETS TOO MUCH PENSION! THE TEN COMMANDMENTS – 7:00PM Saturday (ABC) Celebrate Easter with Cecil B. DeMille’s biblical epic starring Charlton Heston, airing ABC Saturday night. Behold the power of Moses’ beard. ANTICIPATION: LET HIS PEOPLE GO!